Crawley Town head coach Gabriele Cioffi suffered his first defeat since being taking charge through a second half goal by Reuben Reid. The 70th minute strike was deflected on its way into the Reds’ net as the Green Devils maintained their unbeaten league record. Cioffi named an unchanged team from the one which beat Morecambe 2-0 last Saturday and beat Lincoln City 1-0 the week before. Reds suffered an early blow when Mark Connolly limped off with an injury and was replaced Joe McNerney. Crawley went on the attack from the start as Ollie Palmer headed over, Joe Maguire nodded a chance straight at the ‘keeper and Palmer and George Francomb combined to force Brighton & Hove Albion loanee Robert Sanchez to make a double-save. At the other end Reds’ ‘keeper Glenn Morris made a save in the first minute to deny Tahvon Campbell. Lewis Young did well to intercept a ball from Liam Shephard to Campbell which cut out a good chance. Forest Green had an appeal for a penalty turned down when Luke James went down in the box. Filipe Morais was denied from long-range by Sanchez who pulled off a fine save. James twice had chances to score in the first half, one with his head which he could not get on target. Early in the second half Crawley’s Luke Gambin, who is on loan from Luton Town, came on to make his debut in place of Dannie Bulman. Morris was in action to make a save from Carl Winchester, before making a clearance on the line after an effort by Campbell went through his legs. In the 59th minute the whole stadium gave a massive round of applause in memory of Crawley Town fan Gill Courtnell who has sadly passed away from cancer. Forest Green took the lead through a run into the area and deflected shot by topscorer Reuben Reid. Gambin soon had his first chance to score in what was Reds’ first chance of the second half but it was well saved by Sanchez. James and Reece Brown both had attempts on goal for the home side as they pressed for a second goal while Joseph Mills rattled the Crawley crossbar. Forest Green nearly made it 2-0 with eight minutes to go when Shephard received a cross from Joseph Mills but could not find the target. 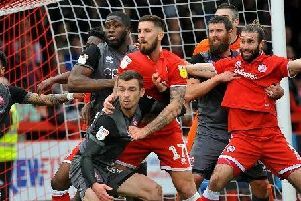 In added-time Reds’ substitute Joe McNerney was sent-off for a second yellow card, a foul on Williams, meaning they had to see out the final moments with just ten men.